Visit Angkor Complex temples, local villages, and enjoying night life in Siem Reap. 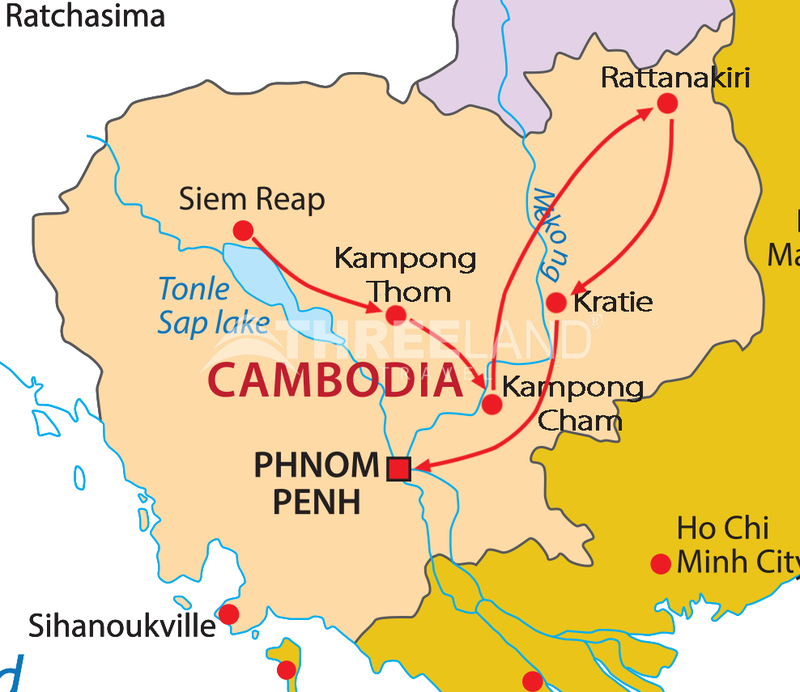 Visit the old city of Khmer - Kampong Thom and Kampong Cham, and the mountainous northeastern city of Banlung. Visit PhnomPenh with Royal Palace, Silver Pagoda. You will be welcomed and greeted by our professional tour guide at Siem Reap airport and transfer to hotel (The room maybe not yet ready until afternoon). After check in, will drive to Mechhrey Eco Tourism community. Here you will have chance to enjoy optional ox cart ride through the village. You will enjoy boat ride to visit the floating village where you will see how people live on the surface of water. You will find floating house, markets, pagoda, school, hospital… Tonight we will enjoy buffet dinner with Apsara dance performance at a local restaurant. Overnight in hotel in Siem Reap. 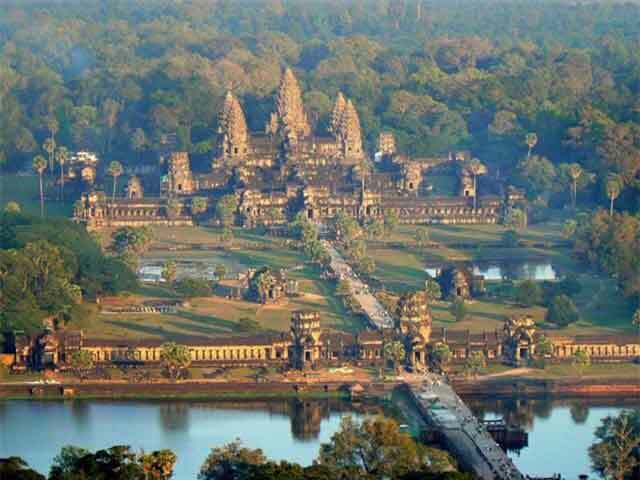 After breakfast at hotel, visit the most famous of all the temples on the plain of Angkor: Angkor Wat. The temple complex covers 81 hectares and is comparable in size to the Imperial Palace in Beijing. Its distinctive five towers are emblazoned on the Cambodian flag and the 12th century masterpiece is considered by art historians to be the prime example of classical Khmer art and architecture. Angkor Wat's five towers symbolize Meru's five peaks - the enclosed wall represents the mountains at the edge of the world and the surrounding moat, the ocean beyond. We continue to the South Gate (with its huge statues depicting the churning of the ocean of milk), the ancient capital of Angkor Thom (12th century), Bayon Temple (unique for its 54 towers decorated with over 200 smiling faces of Avolokitesvara), the Royal Enclosure, Phimeanakas, the Elephants Terrace and the Terrace of the Leper King. We will end our day discovering Ta Prohm, one of the area's most beautiful temples. Ta Prohm has been relatively untouched since it was discovered and retains much of its mystery. Late afternoon, you will enjoy Remork ride (commonly called Tuktuk) around the city and to a local pagoda where you will have a blessing ceremony by Buddhist monk for the prosperity, happiness and safety for your trip. Overnight in hotel in Siem Reap. Breakfast at hotel, heading out to Kompong Thom province (147 km), visit to the old city of Khmer in the pre Angkor Period (Sambor Prei kuk) and proceed to Kompong Cham, visit to Phnom Bros, and Phnom Srei temples, local market, and overnight at hotel in Kompong Cham. Leave this morning by car from Kompong Cham and proceed to Banlung. Banlung City is the provincial capital of Ratanakiri Province in Cambodia's mountainous northeastern corner. Heavily jungled and home to 12 different 'Khmer Loeu' ethnic minority groups, Ratanakiri province has a real edge-of-the-world feeling. Free time at your own leisure. Overnight in Ratanakiry. Breakfast at hotel. We start our adventure journey on a bumpy road for the discovery of the surrounding waterfalls. Teuk Cha Ong is the most impressive of them. Next to the waterfall of Okatchagn is a hill tribe village with elephants which may be observed in the forest. We continue to visit Ka Chaign waterfall as well as Ka Teang waterfall. Lunch local restaurant. We will spend our rest of time relaxing, swimming around at the volcanic lake of giant Loam, superb place surrounded by pristine rainforest – Boeng Yeak Laom. Overnight in Ratanakiry. Early shopping in the Banlung market, then we transfer by overland back from Banlung to Kratie. Kratie is famous for its Dolphins Irrawaddy, whose about sixty specimens there is. The road which follows the river is lined with traditional Khmers houses rather old, and to walk is there very pleasant. Overnight in Kratie. Breakfast at hotel. We take a long drive to Phnom Penh. Overnight in Phnom Penh. Breakfast at hotel: today we visit Royal Palace, built by King Norodom in 1866 on the site of the old town, and the Silver Pagoda. Located within the grounds of the Royal Palace, the Silver Pagoda is so named because of its floor, which is made up of 5000 silver tiles. The treasures found inside include a solid gold Buddha encrusted and weighing 90kilograms and a small 17th century emerald and baccarat crystal Buddha. Then we continue to explore the Toul Sleng Prison Museum and the Killing Fields of Choeung Ek-both grim reminders of Cambodia's bloody past under Pol Pot. It is almost inconceivable to confront the nature of true evil here in this gentle land, but the Buddhist memorial at Choeung Ek, commemorates the 1.7 million victims of the 1975-79 Pol Pot regime. This excursion may prove distressing for some. It is, however, an important piece of this country’s historical and cultural puzzle. Transfer to airport for your departure flight.